Designed to run within the AmpliTube Custom Shop plug-in, IK Multimedia Ampeg SVX 1 & 2 Bundle includes Ampeg SVX and Ampeg SVX 2, a collection of emulations which aim to digitize the distinctive tone of Ampeg bass rigs. With this download you get seven amplifier emulations, nine cabinet models, six microphone setups for the cabinets, and eight stompbox simulations for use with electric basses. This software is compatible with Mac and Windows platforms, and works in VST2, VST3, AU, and AAX formats running at 64-bit. It also operates as a standalone application, in which case you'll have access to a multitrack recorder to capture ideas. IK Multimedia’s Ampeg SVX is software that emulates the world-renowned and well-regarded sound of Ampeg amplifier heads and speaker cabinets. It also provides models of the microphones used to capture these cabinets in the studio, as well as a comprehensive pedalboard with overdrive, wah, chorus, envelope filtering, and more. You’ll even find a digital, accurate, and chromatic tuner. Designed to run within the AmpliTube Custom Shop plug-in, IK Multimedia Ampeg SVX 2 offers a collection of bass amplifiers and cabs that emulate the world-renowned and well-regarded sound of Ampeg amplifier heads and their matched speaker cabinets. It is primarily intended to be used with electric basses, though it has been known to sound good on guitars, keyboards, or any signal to which you'd like to lend the sound of a bass amplifier. 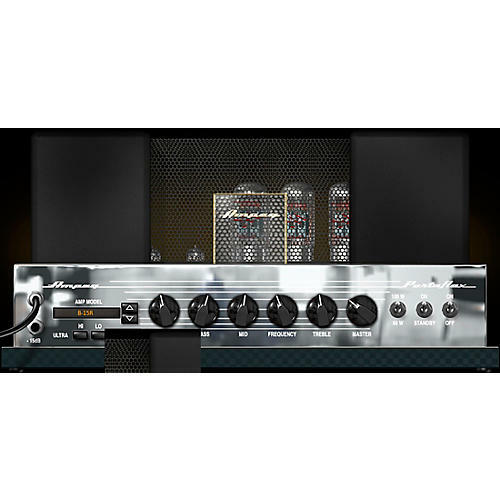 Ampeg SVX 2 employs the company's Dynamic Interaction Modeling technology to recreate the fine interactions of complete internal circuit stages of the original models and reproduce their unmistakable vibe and dynamics down to their finest nuances. You can further customize your bass sound using the AmpliTube Custom Shop's full-rig signal path, with tuner, pedalboards, amp head preamp, effects loop, power amp, speaker cabs, mics with room effects, and post-rack effects.